After six weeks of talking about Nine-Boxing as a practical way to grid performance and potential, I now come to the culminating corner, the penultimate piece of your succession plan. 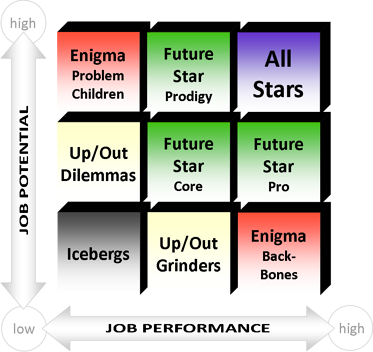 The upper-right corner of the performance-potential matrix is where, in a perfect world, all of your staff would reside. The All Stars in your organization are those people who are realizing their full potential while at the same time performing at their peak. This is the dream team of organizational players. They are well-equipped to take on any assignment and poised to transform your organization into a better version of itself. But caution must be taken with these rarified All Stars for they can easily become bored and thence, to your dismay, lured elsewhere. Accordingly, I offer a brief care manual for best practices in sustaining and cultivating the "top guns" in your succession plan. Find ways to make them shine. Give them challenging, stretch assignments doing things nobody else has done. The top All Stars in your organization should be tasked with high stakes, high-profile assignments that show them off to others in your talent pool. Earmark them for start-ups or spin-offs where they will add even more tools to their arsenal while helping to take your organization in new directions. Lastly, identify parts of your organization that may need financial or operational turnaround and assign an All Star to make the repair. Give them opportunities that nobody else gets. Grant them access to exclusive training opportunities, send them to national or international conferences, appoint them to high-profile committees in the organization. Consider the formation of a cross-functional association among All Stars that serves to build relationships and provide support to all of your key organizational players. Allow them elite access and exposure to the CEO, senior leaders and the governance structures in your organization. Provide them with shadowing opportunities where they can unhook from their present role and walk with another in a role they may hold in the future. Your organizational All Stars are also ideally suited to serve in a leadership capacity on civic boards and committees. They represent the best of your organization to the community while they learn about leadership from an external and public perspective. Customize a plan for their ascension as executives. Form a clear and mutually agreed upon developmental plan that tracks each All Star into the ranks of executive leadership. Pair them with a mentor in senior leadership that can guide them along that path and help you in watching for any signs of dissatisfaction or potential threats to retention. Seek out opportunities for them to serve as a role-model to others by asking them to mentor and coach the Future Stars discussed last week. Consider providing them with an external coach to help them enhance their potential and expand their skill set further. Ensure that they know how much you and the organization value them. Monitor each All Star closely for any signs of frustration with role-conflict, boredom from a lack of challenging work or burnout from being spread too thin. Review their compensation and benefits at least semi-annually, if not quarterly. Think of your All Stars as talent on steroids. They expand in capability and value to your organization at a rate exponentially faster than "normal" employees. Accordingly, you must be sensitive to the recognition and reward imbalances that can be created from that expansion. The greatest investment of developmental dollars in your succession plan should go into retaining, engaging and advancing your organization's All Stars. This is where your business gets the greatest return on investment. These bright shining lights promote all that you have done right in growing your own leaders. You should broadcast this to your people, to others in the community and to the industry at large. Remember, your human capital is the only truly flexible asset and the only one that can vastly exceed your expectations.